Tonari no Kaibutsu-kun | Manga Reviews ~ Ramblings of A Fob. MORE MORE MORE. I must read more! There comes a time when you would find a certain series that just majorly had IT that it just CLICKED to you wihtout even realizing it. 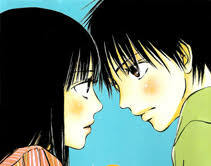 Now I had felt this CLICKED to just a few series, last time being my current fave that is Kimi ni Todoke. But now comes Tonari no Kaibutsu-kun. Heck I don’t even know how to compose the grandest of the grand introduction for this series as my mind is definitely squeezing every parts of my brain to come up with such praise and raving vocabulary words to express how I am truly smitten by this series. Its just a breathe of fresh air so to speak. I’m totally lost for words I am definitely in awe. I’ll eventually get over it but not anytime soon. Anyway to make this ramblings short, well if I could but yeah this is such a fantastic series. Its about this girl named Shizuku who only think about herself, her grades and her ambition to earn a yearly income of a million yen who find herself involved with a boy named Haru. As it so happen Haru hasn’t been good at attending to school, his eccentric behaviours and his delinquent appearance doesn’t help much either..
At first, this series moves in such fairly fast pace where Shizuku delivers the study prinouts for Haru as he didn’t show up for the opening ceremony. This series is such a treat especially for shojo lovers out there who would never imagine that a single series out there can break out of the normal stereotypes. For a changed we have a female girl who is set in life and a purpose to reach. Shizuku doesn’t care if she is the “IT” girl nor would even involve herself to other peoples business, in short she’s only for herself. But then all that is slowly changing as she spend her time looking out after Haru. Haru is what makes Shizuku question the sole purpose of her existance. She just couldn’t leave Haru alone in school since he’s so estrange to school life. Thus starts of their whacky albeit very endearing affairs. The series doesn’t have an actual plot as of the moment. Its merely like a day in Haru school life in. Even though there is no plot whatsoever the budding romance and the often eccentric demeanor of Haru is what makes this series so darn amusing. I’m sold to their persona, it maybe unbelievable but heck I just can’t help but to root for the characters. There ARE a lot of instances that I get confused but it doesn’t detract me from the entertainment that it gives. Haru is just like a caveman would be if he suddenly find himself in a modern world. It’s pretty much random, funny all together. LIKE SERIOUSLY chicken in school? Dude is so oddly bizarre. He is damn right charming. I really like all the main and the supporting casts. The internet beauty and the baseball guy added some appeal to the series. They are such an additional delight. They may not have played an important part yet but I could definitely tell they’ll get a spotlight latter, well here’s hoping.. I also like the main characters interactions, its never dull and I find their banter to be rather subtly intellectual. The series engaging characters, random, upbeat and light hearted atmosphere that it gives is what won me over. Its a little on the slow side but if this series gets its momentum going it maybe very well rival Kimi ni Todoke as one of my favourite shojo series ever. With that, I give my highest possible recommendation in a heart beat. VIZ should have this for their Shojo Beat title long ago! It’s just that GREAT! Now that you mentioned it that’s a more reasonable way to put it. Haru may have some form of autism. He could be that he’s Asperger but then again as you mentioned it he’s a fictional character so that may seem irrelevant. What I believe though is that the author made Haru like that so that he could easily provide a way to get the entertainment/comedic relief of the series. After all its much easy to get away with it. But if we’re realistically speaking Haru does possess the characteristics of an autism individual. He’s like Adam from the movie Adam. They’re both have problems socially, really smart and doesn’t have the sensiblity of the feelings of others.